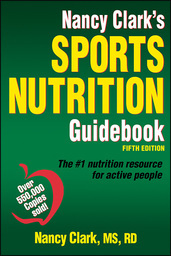 Welcome to the ancillary website for Nancy Clark’s Sports Nutrition Guidebook, Fifth Edition. The image bank includes all of the figures, illustrations, and tables from the text, sorted by chapter. Images can be used to develop a customized presentation based on specific course requirements. Nancy Clark’s Sports Nutrition Guidebook includes the latest research on hydration, vitamins, supplements, energy drinks, organic foods, and balancing carbohydrate and protein intake for exercise and competition.